Summon: See a vision of a random creature, then you must choose a creature to transform into it. Bringer of Nightmares is a legendary Intelligence creature card. 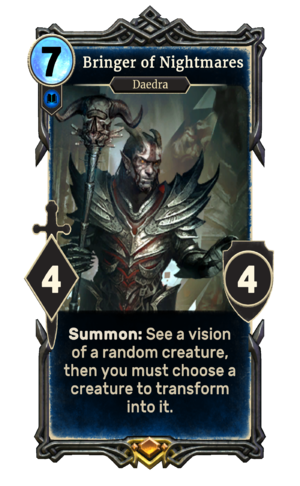 It is part of the Heroes of Skyrim expansion. "I will rend your flesh!" You can not cancel the effect. If the time runs out, Bringer of Nightmares itself will transform into the shown creature. Prior to July 2017 and Update 65.2, the card had a cost of 6. This was changed due to its "variable output" at 6 magicka. This card depicts the Skull of Corruption.